Frederic Durand, CEO and founder of telecoms and software specialist, Diabolocom, discusses the importance of human interaction in contact centres. As the modern business landscape becomes ever more competitive, simply meeting customer expectation no longer goes far enough. In order for businesses to gain the competitive advantage, they must focus on exceeding customer expectation by creating unforgettable experiences that will positively promote their brand above that of the competition. Humans are driven by emotion and emotional connections. Ease of access to the internet and the increased use of social media networks empower customers to voice their opinions when their brand experience is good and when it is bad. Building customer loyalty relies on positive human interactions that evoke positive emotions and encourage customers to come back for more. Personal recommendation is a powerful way to sell your brand as happy customers promote the business to friends, colleagues, family members and business associates. The role of a contact centre is to provide a frontline interface between a business and its customers. It is an easily accessible communication tool where every interaction has the potential to make or break the brand image. 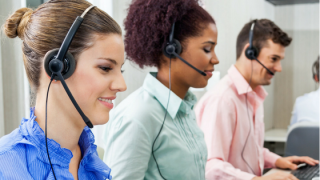 Investing in the provision of outstanding customer service by combining technology with the commitment to properly train and develop contact centre staff, could be the secret to making your centre stand out from the crowd. Of course, contact centres are reliant on technology and the available software and systems offer businesses great opportunity for smooth call handling, easily accessible help menus and FAQs alongside significant cost saving potential through reduced reliance on call agents and the ability to better utilise staff. Call handling technology enables businesses to deliver first point of contact service, self-service options and numerous automated services, providing an essential quick access point of contact for customers. Investment in robust technology is essential in delivering a professional customer call handling experience. But what happens when the technology doesn’t meet the customer requirements and the caller needs or wants to speak with a real person? Often in these circumstances, the customer can look for human interaction because they are confused, frustrated or angry and a positive dealing with a call agent provides an ideal opportunity to transform a negative experience into a positive one. In our busy lives, consumers do not always have the time available to email or speak with an agent in a contact centre making self-help options an essential service, but many others still want an element of human interaction. This is when a call agent can make or break the customer relationship with your brand. The ultimate customer experience is found in balancing technology with real people; using the technology to support the agents enabling a more streamlined service to callers. Self-service options are an excellent tool for quick solutions to queries but for more complex requirements or when the self-help menu fails to provide the required information, customers need to have the option to liaise with a human in an easily accessible, timely fashion. Human interaction in a contact centre has its limitations. The nature of the environment means the face to face element of communication is missing making it all the more important for business leaders to incorporate an exceptional customer experience strategy, using the opportunity to develop and maintain strong relationships with each customer interaction. The contact centre agents have the power to listen to customers and provide considered responses, feedback and personalised solutions. Technology is powerful but it cannot empathise. This is a human emotion and only a human interaction can create the emotional connections made through empathy. The key to fully engaging customers is to drive positive emotions. A well trained, professional agent is invaluable when technology cannot provide the support the customer needs. According to a 2017 Forrester Research report customer expectations have increased while overall consumer trust in companies has gone down. The report highlights that many brands are failing to deliver to the increase in customer expectation. In a highly competitive marketplace, brands are no longer able to gain competitive edge on price alone so focusing on exceeding customer expectation offers an opportunity for businesses to lead the way, excelling above the competition. Brand loyalty has the power to drive significant financial return as consumers are often willing to pay more for an enhanced experience with a company they trust. As consumer expectations shift, business leaders have begun to realise the potential impact of investing in a service standard above that of competitors. The contact centre industry provides an invaluable service to customers enabling quick and easy communication, fast responses to problems and empowering customers to interact with your business in a convenient way. Businesses cannot afford to choose technology over personal interaction. There is a vast landscape of valuable technology available but business leaders must think beyond the technology and place focus on a strong human interface. The role of technology in the centre must go beyond call handling, providing a robust support tool for human interactions, ensuring that call agents can provide a truly personalised service. All unique moments in customer experience, good and bad, can define customer relationships with your brand. It doesn’t matter what business you are in; building and maintaining a positive and trusting brand reputation can be the key to business success. Consistently delivering outstanding service to your customers through positive human interactions supported by reliable technology has the power to drive brand loyalty and ultimately increase sales along the way. We must ensure that our contact centres have both the human and the technological resources they need to deliver an outstanding service. Only by connecting the right technology with a customer centric workforce can the centre hope to truly exceed customer expectations.